Opera made waves back in April when it announced the addition of unlimited free VPN service to its desktop web browser. VPN, or virtual private networking, is a technology that allows people to mask their actual IP addresses by routing their internet traffic through a third-party server. This way, any software that might collect information about users as they visit a website will not be able to record a user’s actual IP. People also often use VPN services to spoof their region, with the most widely discussed example being people who use a VPN client to make it appear to Netflix as though they’re based in the United States. VPN services are incredibly valuable to people who protect their privacy while surfing the web, but these services can also have costly subscription plans that limit the amount of data you can use each month. That’s why Opera’s initial announcement was so intriguing, but the company has no intention of stopping with desktop browsing. Opera on Tuesday announced the release of a brand new Android app. DubbedOpera VPN for Android, the app does exactly what its name suggests, providing Android users with VPN service that will route their traffic through special servers to mask users’ info and prevent websites from tracking them. Of course, Android VPN clients are a dime a dozen. What makes Opera different from most, as we’re sure you’ve figured out by now, is that it offers users unlimited VPN service for free. 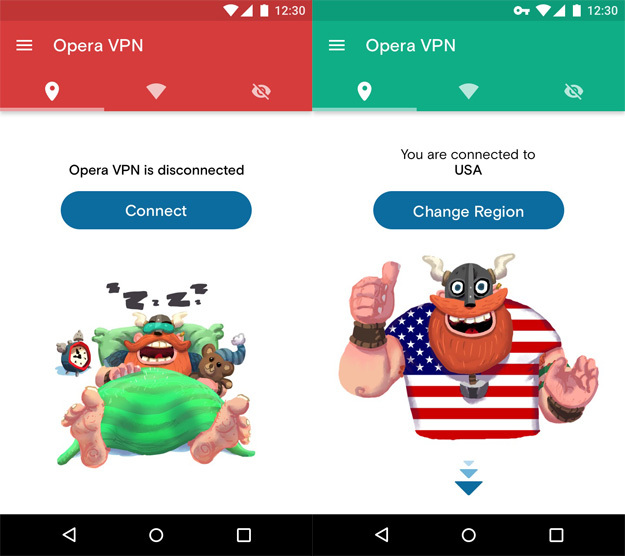 “The Opera VPN app for Android sets itself apart from other VPNs by offering a completely free service – without a data limit, no log-in required, advanced Wi-Fi protection features and no need for a subscription,” said Chris Houston, who heads Opera’s VPN division. Opera’s new VPN app for Android really couldn’t be easier to use. It’s as simple as opening the app and tapping connect, and for most users concerned only with privacy, that will be enough. People who want to mask their regions as well can choose from five different regions including the US, Canada, Germany, Netherlands and Singapore. The app also includes a few additional features, such as the ability to scan Wi-Fi networks for security and display the number of ad trackers blocked over a certain period of time. Opera VPN for Android is available as a free download on the Google Play store beginning immediately. Dieser Eintrag wurde veröffentlicht in Einfachheit und getaggt mit Opera VPN am 24. August 2016 von innovation. The Economist Intelligence Unit just released a report that ranks the best and worst cities to live in the world. In its „A Summary of the Liveability Ranking and Overview“ of 140 cities surveyed, it looks at which cities have the best living and worst living conditions. This includes healthcare, education, infrastructure, safety, and the threat of terrorism. Interestingly, the rankings also take into account the generosity of expatriate relocation packages — funding a company gives to an individual when they decide to take up a role abroad. The 140 surveyed were given a mark out of 100 across various sectors and then given an overall score out of 100. 9. Helsinki, Finland — It is only one of two European cities to make the top nine list. It scored full marks for stability and healthcare and highly across culture and environment, infrastructure and education. 8. Auckland, New Zealand — The city scored full marks for education but narrowly missed being seventh in the charts due to a score of 92.9 for infrastructure. 7. Perth, Australia — This is one of three Australian cities to feature in the top nine, thanks to perfect 100 scores across healthcare, education, and infrastructure. T=5. Calgary, Canada — This is one out of three Canadian cities that ranked near the top of EIU’s survey and tied with Adelaide in Australia. It scored 100 for stability, healthcare, and education. 4. Toronto, Canada — The most populated city in Canada got an overall score of 97.2 but missed out on ranking higher due to its infrastructure score dragging it down. 3. Vancouver, Canada — The major Canadian city received 100 for culture and environment, healthcare, and education and nearly perfect scores for stability. 2. Vienna, Austria — The city is one of only two European cities to make the top nine list with a score of 97.4. Dieser Eintrag wurde veröffentlicht in Einfachheit und getaggt mit Liveability am 20. August 2016 von innovation. Elon Musk, in the words of one blogger who did a series of in-depth interviews with the Tesla and SpaceX founder, is, basically, „the raddest man alive.“ Who could fail to be impressed by a single entrepreneur who has set his sights on both getting humans to Mars and revolutionizing our energy economy? Because Musk is so obviously extraordinary, it could be easy to feel like his career is a world apart — the efforts of a visionary that mere mortals like us could never emulate. But while it’s probably true that, for most of us, the ship has sailed on leading the way to interplanetary travel, that doesn’t mean folks with more down-to-earth careers have nothing to learn from the mogul. The takeaway: if you want to do great things, focus on the difference you’ll make in the world (or to yourself), not the financial rewards (or the glory). A lot has been written about Musk’s mindset, but Altucher sums up his unusual and incredibly effective approach with this quote: „Boil things down to their fundamental truths and reason up from there.“ In short, to improve your thinking, set received wisdom aside and try to look at the world with fresh eyes, using objective data and clear-headed observation. „It is a mistake to hire huge numbers of people to get a complicated job done. Numbers will never compensate for talent in getting the right answer (two people who don’t know something are no better than one), will tend to slow down progress, and will make the task incredibly expensive,“ Altucher quotes him as saying. 6. Talent can’t compensate for a lousy personality. According to Altucher, Musk is a late but fervent convert to the idea that great ability can’t compensate for a lousy personality. Here’s the quote: „My biggest mistake is probably weighing too much on someone’s talent and not someone’s personality. I think it matters whether someone has a good heart.“ So, once more with feeling: don’t hire jerks! You’d think that someone with Musk’s achievements might be satisfied with his efforts, but that’s not the case. Musk claims he constantly strives to improve himself. „It’s very important to have a feedback loop, where you’re constantly thinking about what you’ve done and how you could be doing it better. I think that’s the single best piece of advice: constantly think about how you could be doing things better and questioning yourself,“ he said. If Musk isn’t resting on his laurels, neither should you. Dieser Eintrag wurde veröffentlicht in Innovatoren und getaggt mit Elon Musk am 19. August 2016 von innovation. What can we learn from Elon Musk? The three fundamentals to Elon Musks success. How to constantly build your knowledge and understanding. Since childhood, he has been a tireless self learner. At the age of 10 he resorted to reading Encyclopedia Britannica after devouring every other book at home. From interviews and discussions with Musk, its becomes apparent that he views people as computer systems, being made up of hardware (body) and software (mind). Recognizing that your software is one of the most powerful tools that you possess, Musk works tirelessly on updating his, feeding it with more knowledge and information when he wants to understand a problem. In 2000, before Musk had even set up SpaceX, he began devouring books on propulsion, avionics and aeronautical engineering. He already knew that his goal was landing people on Mars, now he just needed to upgrade his software with the information and tools on how to accomplish it. A trait that underpins Musk’s model of thinking is being able to quickly consume and understand complex information, then plan with clarity how to apply it in making progress towards his goal. People are impressed with his deep knowledge across a wide range of technical subjects, from electrical, structural, mechanical, aeronautical, and software engineering through to business strategy and more. “I think most people can learn a lot more than they think they can. They sell themselves short without trying. This habit of self learning and forcing himself to understand new concepts, gives him a huge internal database of knowledge that he is then able to run through his internal problem solving tool. How to get to the nucleus of a problem and understand the facts. Aristotle described a first principle as, “[the] first basis from which a thing is known”. It means basing conclusions on fundamental truths, not on assumption or analogy. Reasoning from first principles requires mental effort. It means boiling things down to their most basic truths, and reasoning up from those truths. It requires you to actively engage your brain and work ideas through. The alternative to this is reasoning by analogy. Assuming something is true or correct because it’s similar to something else that has been done before. “Historically, all rockets have been expensive, so therefore, in the future, all rockets will be expensive. But actually that’s not true. If you say, what is a rocket made of? It’s made of aluminium, titanium, copper, carbon fiber. And you can break it down and say, what is the raw material cost of all these components? If you have them stacked on the floor and could wave a magic wand so that the cost of rearranging the atoms was zero, then what would the cost of the rocket be? And I was like, wow, okay, it’s really small—it’s like 2% of what a rocket costs. So clearly it would be in how the atoms are arranged—so you’ve got to figure out how can we get the atoms in the right shape much more efficiently. In our day to day, we make most decisions based on analogy. It would simply take too much mental time and capacity to question every single small decision during the day. But when it comes to big decisions, it’s important to reason from first principle. Make sure you know the facts, data and figures, don’t just follow the crowd and assume. How to give your ideas the best chance of success. Highly intelligent, fast learning, dynamic problem solving ability and lots of money, they’ve all contributed to the success of Musk’s endeavours. But there’s another key character trait to the man which has been critical to his success – an incredible and highly efficient work ethic. The fact is that Elon Musk gets a lot done. Running two separate billion dollar companies requires making a lot of decisions and having eyes on many moving parts. Here are some of the key aspects to Musk’s working process that make him so efficient. – 100 hours a week – has noted many times that at critical periods in the lifespan of his companies, he has gone from working 80-90 hour weeks up to doing 100 hours a week. It is not unusual for him to work seven days a week, normally rising at 7am and getting to bed around 1am. – Batching – or multitasking, he combines multiple tasks which can be done together effectively e.g. Emailing while reviewing spreadsheets, meetings over lunch, etc. – Scheduling – A man as busy as Musk needs to run to a tight schedule to be efficient. He spends Monday and Thursday at SpaceX in LA, Tuesday and Wednesday at Tesla in the Bay Area, and splits Friday between both. His assistant has his planner broken down into five minute slots, and there’s a long line of people trying to get ahold of him for that time. Efficient scheduling is a behaviour pattern seen in many highly successful people. – Caffeine – „To get through the day, Musk relies on two stimulants: caffeine and a desire to help humanity colonize Mars. Until he recently started cutting back on the former, Musk consumed eight cans of Diet Coke a day, as well as several large cups of coffee. „I got so freaking jacked that I seriously started to feel like I was losing my peripheral vision,“ he says. If he realizes how crazy this sounds, he doesn’t let on.” – from Inc Magazine. The five-year timeline isn’t terribly aggressive. Google, Nissan, and Mercedes-Benz see autonomous vehicles on the road by 2020, and Chinese tech giant Baidu says it will have the technology in 2019. But none of them has made promises as specific as those Fields made today. “We see the upcoming decade for the automobile really centered around the automation of the automobile,” CEO Mark Fields says. Many automakers already offer limited automation in vehicles like the Tesla Model S and Model X (which have had trouble), and the Mercedes E-Class (that one’s a bit confusing). But Ford, like Google, wants nothing less than full autonomy, a designation the Society of American Engineers calls “Level 4.” Fields says the fleet in Silicon Valley won’t even have steering wheels or pedals. Ford seems to have most of the pieces needed to do that. 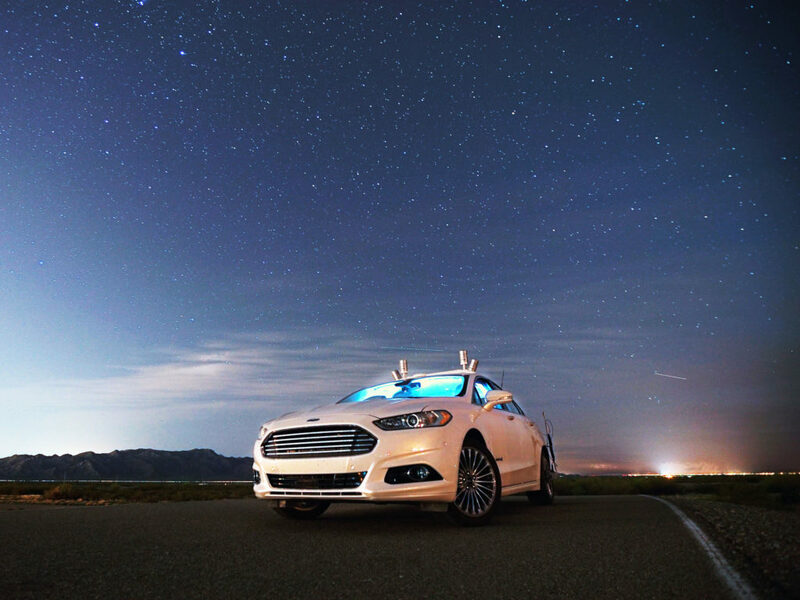 In July, it invested in Civil Maps, a Berkeley, California, startup that makes the software needed to turn LiDAR data into maps robo-cars can read and automakers can update. The automaker just invested heavily in LiDAR manufacturer Velodyne, a bid to cut make the technology far more affordable—the spinning bucket atop each Google car costs about $85,000. And it signed an exclusive licensing deal with Nirenberg Neuroscience to use that company’s machine vision and deep learning tech. Israeli startup Saips will provide further help there with technology that helps robo-cars identify pedestrians, garbage cans and the like. Field’s won’t say what the car might look like or where you’ll see them beyond “dense urban areas.” But the commitment underscores how serious Ford is about autonomy. “It fits very nicely with who we are as a company,” he says. “Autonomous vehicles could potentially have the same impact on society that Henry Ford’s moving assembly line had.” The company that made the Model T ubiquitous wants to do the same with autonomous tech. Dieser Eintrag wurde veröffentlicht in e-mobility und getaggt mit autonomous car am 17. August 2016 von innovation. The next 60 years of wireless and networking technologies will be exponentially more exciting than the first 60 years. As radio frequency (RF) bandwidth becomes consolidated under that banner of the worldwide right of every citizen to connectivity, the technologies of photonic LiFi, peer-to-peer communications, and low-orbit satellite integration for back-haul will unify the Earth. Flexibility will be an option on all components in the future so that devices can be shaped for different purposes. The Nokia flexible, transparent smartphone shown above can be shaped into a wrist bracelet or be flattened out for desktop use. The small insert ring allows the user to view functions, such as who is calling, without taking the entire phone out of ones briefcase, backpack, or handbag. The white ring can be worn on the wrist or clipped to a carry-bag strap or another convenient wearable. IBM’s three-stage graphene RF receiver integrated circuit shows (in the top box) the enlarged scanning electron microscope (SEM) image of an integrated circuit. Look closely to see the successful integration of all key RF components (inductor, capacitor, and graphene field-effect transistor—FET). Note (in the bottom box) a single chip which contains a dozen graphene RF integrated circuits per chip, allowing wireless devices, like smartphones, to require only a single 2-by-2 centimeter RF front-end. Click to see the whole infographic. Today, according to a national survey on wearable technology devices, consumers consider accuracy the most important feature of wearables. More than half of those who do not own a wearable, however, will consider buying one in the future when accuracy is improved. Look for wearables to take over every wireless and networking application as accuracy improves every year, according to Valencell—the biometric data sensor technology company. In the future, networks will become „intrusion tolerant“ by adopting a message system that effectively oversees the underlying communications to prevent malicious software from executing. Illustrated above is the intrusion tolerant network designed by Johns Hopkins University to prove the concept of preventing sabotage from disrupting major infrastructure such as power grids and the cloud. Johns Hopkins, in collaboration with Northeastern and Purdue as well as Spread Concepts LLC and LTN Global Communications, developed this approach over the course of five years. Intrusion tolerance protects a network and keeps it running essential services even during an attack. Called the “first practical intrusion-tolerant network service,” this model will be deployed on a global scale long before 2076. As the first network service that can overcome sophisticated attacks and compromises, it has undergone evaluation and validation in tests that ran for nearly a year using the LTN Global Communications cloud. The test showed success, but the price will have to be reduced for vital infrastructure networks such as power grids and commercial clouds. All remote controls will be voice controlled long before 2076, using technologies such as Texas Instruments‘ new voice control solutions for remotes. As part of its SimpleLink ultra-low power platform, it was specifically created to help developers easily add ultra-low power Bluetooth low energy, ZigBee RF4CE (radio frequencies for consumer electronics) or even combined multi-standard connectivity to voice controlled remotes for TVs, set-top boxes and other consumer electronics. Multi-standard devices can use TI’s CC2650, which combines both RF transmitters or use the same boards for multiple products using only one of the RF transmitters. Voice-activated RF commands such as search, gesturing and pointing also save power compared to the infrared remotes used today. Today smartphones and other wireless devices, such as machine-to-machine (M2M) IoT devices must cope with all the multiple bands used for the same functions in different countries (and sometimes in different regions of the same country). That means as many as a dozen RF front-ends in the same device. In the future, however, software-defined radios will lessen that burden by allowing a single radio to be tuned to a variety of bands, leaving multiple RF front-ends on for bands that must run simultaneously (such as LTE, Bluetooth, and WiFi). The world’s first commercial software-defined radio is already here from Silicon Labs which supports FM, HD Radio, and Digital Audio Radio (DAB/DAB+) broadcasts. However, in the future any RF band will be available in a software-defined radio that allows the designer to build-in automatic changing of frequencies as people travel the globe. If we assume that 5G bands and networks will begin replace 4G by 2020, and that the next generations beyond that will come along at roughly decade intervals, then by 2076 we will be at 10G. None of the analysts to whom I spoke would commit to predicting anything 60 years out from now, so I’m going out on a limb here; get ready for a wild ride. 5G’s stated goals are to more efficiently manage the entire spectrum—from ultra-sonic to ultra-violet light—rather than continue concentrating on the 2.4-GHz band designed to cook meat in microwave ovens and already affecting the health of humans working too close to microwave towers. In addition to faster data rates (up to one gigahertz, 1-GHz), 5G also aims for lower battery consumption, lower outages, better coverage, lower latency, lower infrastructure costs, higher scalability, and more reliable communications. What could 6-to-10G add: connectivity with household devices (thus eliminating the tangle of wires behind every desk, TV, and home entertainment console), peer-to-peer communication (to reduce backbone congestion), compatible protocols among every band, integration with Li-Fi networks (that use LED signaling for communications), and low-orbit satellite integration for back-haul. Wireless RF identification (RFID) tags began as espionage tools invented by Léon Theremin for the Soviet Union to retransmit incident audio—in other words as passive „bugs.“ In 1945 when they were invented, sound waves vibrated a diaphragm which altered the shape of a radio-frequency resonator thus modulated it. Even though this device was a covert listening device, it inspired the current generation of passive RFID tags that are proliferating wildly—from inventory tracking to finding lost pets. By 2076, every device manufactured will have a built-in RFID capability so that no piece of equipment will ever be lost again (of course also spawning a black-market industry of how to defeat them). Artificial neural networks (ANNs) are the only technology capable of solving tough multi-variable problems in nondeterministic polynomial time—called NP complete (although quantum computers too are said to be able to solve NP complete problems but have yet to fulfill that promise). ANNs, on the other hand, are easily constructed to solve NP complete problems with mixed-signal materials (such as memristors), as well as with emulating digital networks, such as IBM’s True North. Deep learning, which merely means an ANN with many layers, is the latest catch phrase, but by 2076 superconducting ANNs, whether mixed signal, all digital, or quantum based, will be the smartest artificial intelligences in the universe. The good news is that they will not take over the jobs of humans, but will extend their capabilities by being in constant wireless contact with human implants, allowing them to turn even average intellectuals into Einsteins, and Einsteins into demigods. Long before 2076, wireless/networked consumer electronics will become so ubiquitous that they will no longer be marketed for their features, but for their omnirelevance—that is, how a brand impacts the lifestyle and longevity of the buyer. Omnirelevance is built around an understanding of the customers‘ „journey to a brand“ by maintaining relevance in the face of increasing brand competition. Dieser Eintrag wurde veröffentlicht in Innovation, Mobility und getaggt mit Wireless am 5. August 2016 von innovation.